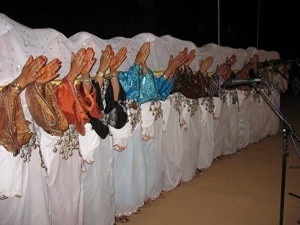 Storytelling is experiencing a revival in many Western countries right now, but the tradition of oral storytelling, or hikayat, in Morocco is almost 1,000 years old. 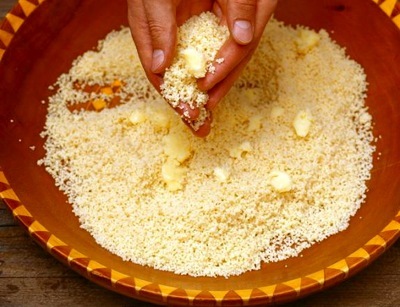 Morocco has a strongly oral culture – everything from recipes to stories to legal agreements have been passed down from generation to generation in the absence of the means to record such information and against the backdrop of widespread illiteracy. In the past, storytellers travelled around to perform in public places and at community events and palace celebrations. They were not only a form of entertainment – they were also used by the authorities to pass information and moral messages. In today’s era of satellite TV and the internet, storytelling is a dying art. 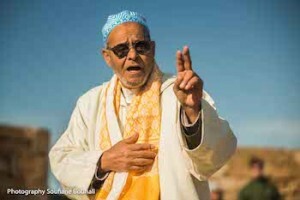 Although visitors to Marrakech may find the odd storyteller on Place Jmaa el Fna, the crowd around them is smaller than ever and because the stories are told in Arabic or a Berber dialect, the performers cannot attract the support of foreign tourists. Today, Cafe Clock in the Kasbah district of Marrakech is the perhaps unlikely bastion of this oral tradition. Both the cross-cultural cafe, with modern graffiti on the walls and the best camel burger in town on the menu, and the storytelling program based there, were developed by Mike Richardson, the cafe’s British owner. 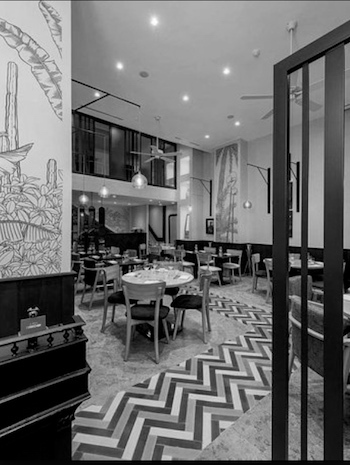 Since December 2013, even before the second branch of Cafe Clock officially opened its doors in Marrakech that March (the first is in Fez), a group of young, enthusiastic Moroccans had gravitated around master storyteller, ‘Haj’ Ahmed Ezzarghani. Since then, they have been working hard to preserve the storytelling tradition and bring the old stories and fables to a wider audience. 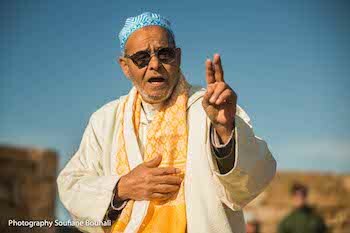 Haj collected stories during his work as a travelling salesman and performed them in the turbulent 1950s outside Bab Boujloud in Fez. Haj meets with his young apprentices three times per week at Cafe Clock. 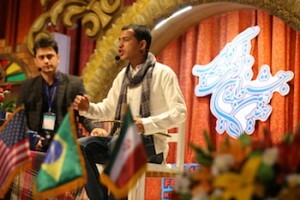 At the first meeting, Haj recounts a story, which the apprentices translate into English and practice. The next time they meet, they perform the story in English and Arabic for the group. Haj doesn’t understand much English, so the young storytellers help each other out and he critiques the theatricality of their performance. On the third meeting, they perform the story for the Cafe Clock audience. 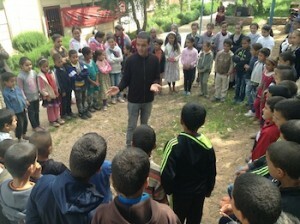 There is a core of four apprentice storytellers, who are all students of English in Marrakech. Jawad Elbied, 24, is just finishing his English degree with a dissertation in Moroccan Storytelling. He says: “Storytelling has a special value in Moroccan society, but young kids today don’t know the stories – they are only interested in the internet and YouTube. Haj reminds me of my grandfather and his generation. He reminds us of our origins.” It is clear that storytelling has benefitted Jawad and his fellow apprentices. He speaks confidently and eloquently in English and twice a week he does so before a large crowd at Cafe Clock. Furthermore, through the Hikayat Program, which is in the process of becoming a non-profit association in Morocco, he has had the opportunity to travel around Morocco and even to Iran to share the stories and teach them to others. The storytellers have also appeared on the UK’s Channel 4 and on Al Jazeera. “The value of stories is that they enable the audience to create their own film; to imagine the characters and the action in their own way,” Jawad explains. “We need to reach out to new audiences by being creative and offering attractive stories.” Through the association, the storytellers hope to use modern technology to diffuse the stories and record them for future generations. 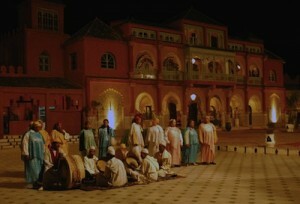 If you would like to hear the stories, they are performed on Monday and Thursday evenings at 7pm Cafe Clock Marrakech. As well hearing the apprentices in English, visitors also have the opportunity to see Haj in action. Even for those who don’t understand Arabic, his performance is a piece of theatre, a relic of a bygone era brought to life and definitely worth seeing! The Storytelling Program has also been extended to Cafe Clock in Fez, where a group of apprentices works with a local master storyteller. 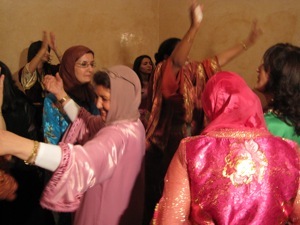 The Hikayat Morocco group is also available for performances and workshops and can be contacted via Cafe Clock or via their own website Hikayat Morocco. The “red hamra” city of Marrakech has been sited as the best African Destination of the Year by the 19th World Travel Awards. The winners of the “World Travel Awards” are chosen by travel agents around the world. 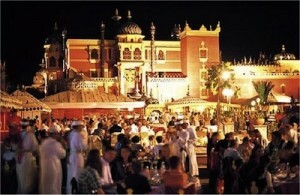 The World Travel Awards gives agents the opportunity to select leading travel destinations. Marrakech is the first Moroccan city to win the this title. Other cities that were nominated were Cape Town, Durban and Johannesburg (South Africa), along with Luxor (Egypt), Mount Kilimanjaro (Tanzania) and Victoria Falls (Zambia). 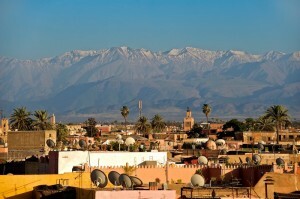 Marrakech has a reputation for being fashionable and has long drawn tastemakers ranging from designers, to actors, models, writers and foreigners looking to explore’s this cosmopolitan city that is surrounded by the majestic Atlas Mountains. From Marrakech’s stunning palaces, gardens, mosques, restaurants and nightclubs it serves as the perfect place to start any Morocco Tour. 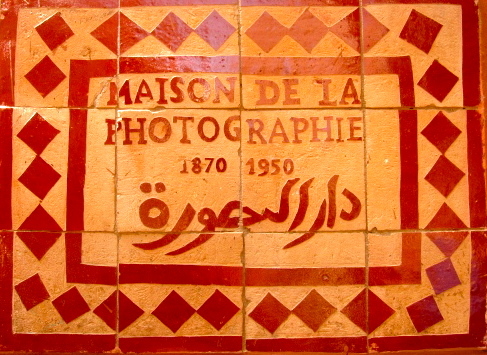 No visit to Marrakech is complete without a visit to La Maison de la Photographie which is close to the Medersa Ben Youssef. Just pass by the door of the Medersa and through the arch across the street and follow the road round passing on your way restaurant Foundak (an excellent place for lunch or dinner) on your left, a school on your right and shortly afterwards you will find La Maison de la Photographie on your left. 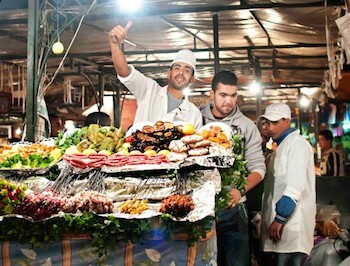 It is truly one of the wonders of Marrakech. Housed in a converted three storey Foundak (the old inns and storage houses for camel trains coming to sell their wares in the souks) which Patrick Man’ach and his Moroccan business colleague Hamid Megrani converted in to a photographic gallery in 2009. There are photographs of Morocco from the 1860’s at the very dawn of photography when intrepid adventurers had to carry heavy equipment into what was still a largely closed country up until the 1950’s and Morocco’s independence in 1956. Early photographers such as Scotsmen George Washington Wilson and James Valentine, took posed pictures for what became the first postcards from Morocco. 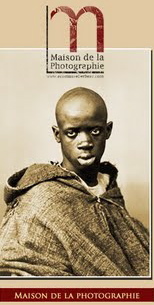 the Spanish Carvilla and many others like the images of Gabriel Veyre, partner of the brothers “Lumière” – inventors of photography in 1839. During his Moroccan period, the photographer immortalized Sultan Moulay Abdel Aziz, taught him photography, and created a coluorful photographic record portraying three decades. Starting in Tangier these photographers gradually began to visit Marrakech and the Atlas Mountains taking pictures of street scenes and then capturing the diversity of Morocco’s Arab, Jewish and Berber inhabitants . There are very few photographic collections as rich as that of Maison de la Photographie which houses 4,500 photographs and 800 of the original glass plates by early photographers. A full reference library is on site and researchers and students interested in Moroccan history are welcome. The exhibitions are arranged on three floors, with large size portraits and scenes from the 1860’s and 70’s to the early20th Century and the late 1950’s. The third floor has a vido room showing the films of Daniel Chicault who took his cine camera to the Atlas Mountains to film in colour unique dance scenes and the village life of the Berber tribes in 1956 and 1957. 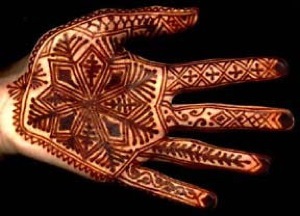 These are of immense anthropological importance and they give us a unique chance to appreciate the wonderful berber tribal heritage much of which is sadly vanishing. 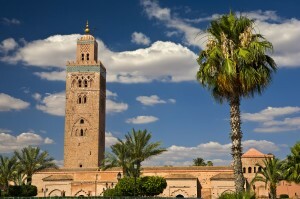 By appreciating Morocco’s past we can understand and appreciate its rich cultural heritage. To crown the visit you can climb the steps to the terrace which has one of the best panoramic views of the medina around as it is one of the highest buildings in the area. 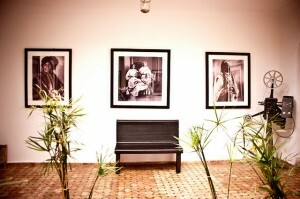 The Maison de la Photographie is the most orignial concepts to have been created in Marrakech in the last few years. Many hotels have bought the photographs which now grace many hotel rooms and La Maison de la Photographie works on exhibitions with most of the leading cultural institutions in Marrakech including the Institut Francais and the Riad Denise Masson to name but two. The new exhibition in the Maison de la Photographie is called: ” Trésors Photographiques du Maroc ” (Photographic treasures of Morocco) : the exhibition of original prints which covers the period 1870-1950 and shows the diversity of the Moroccan population: Arabs,Berbers, Muslims and Jewish people and the splendor of the Mediterranean, Atlantic and Saharian countrysides. Most of the photographers came from Europe, and in the 1870’s, stayed in Tangier, an international city, where legations, soldiers, traders, adventurers, artists, located their activities. 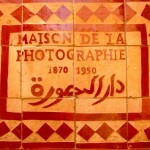 With the colonial period, called the French Protectorate, photographers ventured further towards the South: Marrakesh became a winter resort, and many started to venture in the Atlas, like the painter Majorelle who owned the Majorelle and its gardens in Gueliz on the Boulevard Zerktouni which houses a museum for Majorelle’s paintings and a museum created by Pierre Berget with the Haute Couture of Yves Saint Laurent. 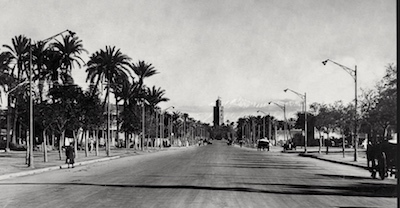 In the Thirties, a group of photographers under the name of Studio Souissi, recorded all aspects of local life. Muller’s exceptional photographs, a donation of his daughter Ana Muller, are exhibited permanently. 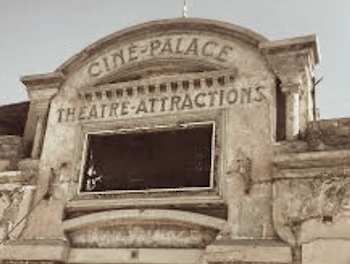 Visitors can view documentaries by Daniel Chicault, from 1957, on the Berbers of the High Atlas and from the panoramic terrace, a view on the Atlas and the medina of Marrakesh. The entrance charge of 40 dirhams includes a conducted tour and and details about the photographers . the staff are english speaking and Patrick Man’ach is on hand to share information and advice. Visitors can buy prints of the photographs on view in the shop at the entrance. 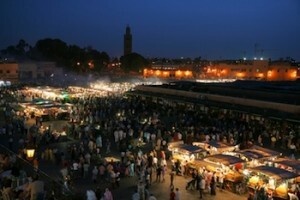 Fantasia in Marrakech at Chez Ali is a spectacular way to see Marrakech by night. This Equestrian dinner and Moroccan music show in the Palmerie of Marrakech, Morocco an homage and touristic replication of the traditional Meknes Fantasia. At Chez Ali in Marrakech, a Moroccan dinner is served with a traditional starter of Harira, with a main course of Mechoui and couscous, all under caidal “tents”. 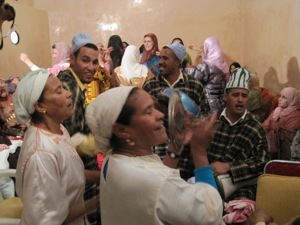 The dinner is complimented by Berber folklore and a wide range of musical styles from Berber groups, Chabbi musicians, Moroccan Rap and Gnaoua. Attendees will see jugglers. the flying carpet, belly dancing and finally the Fantasia show. 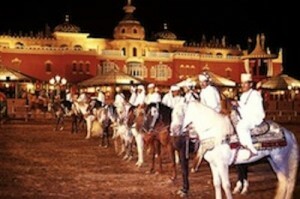 Originating from the region of Meknes Morocco, Fantasia is a war ceremony that consists of opposing groups of horsemen, each representing the best rides of its tribe. The performance is inspired from historical wartime attacks of Berber and desert knights. 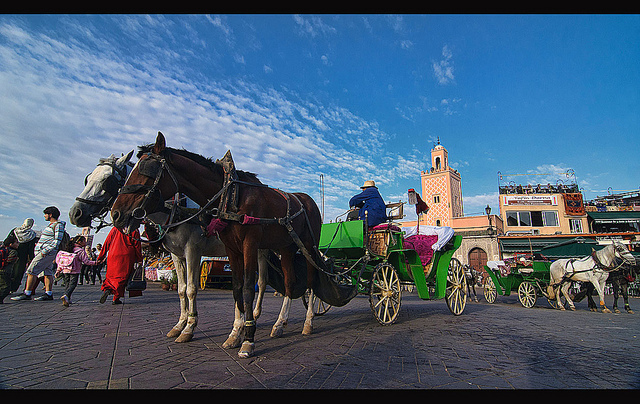 Today, Fantasia is considered as a cultural art and a form of martial art; it also symbolizes a strong relationship between the man and the horse, as well as an attachment to tradition. Each region in Morocco has one or several fantasia groups, called serba, totaling thousands of horse riders nationwide. Performances are usually during local seasonal, cultural or religious festivals, also called mousseum, which translates to “season” in Arabic. This traditional equestrian performance practiced during cultural festivals in Morocco. Fantasia is not the original name as the actual traditional term used is “Game of gunpowder”. Fantasia in its pure form consists of a group of horse riders, wearing traditional clothes and charging along a straight path at the same speed so as to form a line, at the end of the ride (about two hundred meters) all riders fire into the sky using old gunpowder guns. The difficulty of the performance is synchronization during the acceleration and especially during firing so that one single shot is heard. 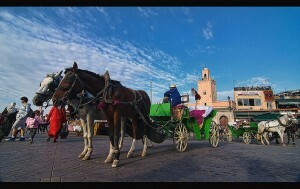 The horse is referred to as fantasia horse. La Mamounia is a legendary property in Marrarkech, Morocco that radiates with class, tradition and beauty. It is said that stepping into Le Mamounia is akin to a setting of 1001 Arabian Nights. 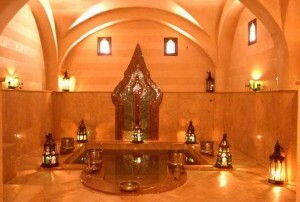 La Mamounia Hotel is a Marrakech institution of Luxury and Flair. Originally the Marrakech palace of a crown prince of Morocco it was converted by the French administration into a hotel in 1923. Named for its 200-year old gardens, which were given as an 18th century wedding gift to Prince Moulay Mamoun by his father, the gardens cover nearly 20 acres and display an incredible variety of flowers and trees. 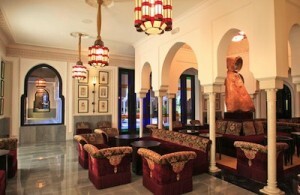 La Mamounia was designed in 1922 by the architects Prost and Marchisio. 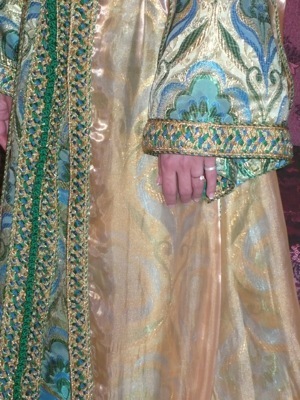 They combined traditional Moroccan designs with the popular Art Deco look of the 1920’s. Winston Churchill called it, “the most lovely spot in the whole world.” He spent many winters at La Mamounia painting the Atlas Mountains and surrounding countryside. 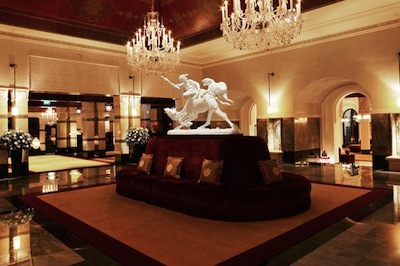 It earned its fame from the day it opened and is considered one of Morocco’s most famous hotels. Situated on the edge of the walls of the old city of Marrakech La Mamounia is where Alfred Hitchcock wrote the movie “The Birds.” Churchill painted from his balcony and declared it “loveliest spot on earth.” Winston Churchill and Franklin D. Roosevelt came to La Mamounia when they met for the Casablanca Conference in 1943, and were said to have grappled with their responsibilities from the roof of the hotel while gazing out at the snow-covered mountains and terra cotta walls of the old city. The suite where Churchill often stayed was renamed in his honor. Other politicians who have enjoyed stays at the hotel include Ronnie and Nancy Reagan, Charles de Gaulle, and Nelson Mandela. During the 1900’s, an era known for early travel in Morocco La Mamounia garnered attention for not just being a hotel but a way of life, where a small exclusive community of ex-pats, colonial rulers and adventurers would sip Scotch in the hotel’s gardens. The most recent renovation by French Designer Jacques Garcia began in 2006 and took 3 years to complete. 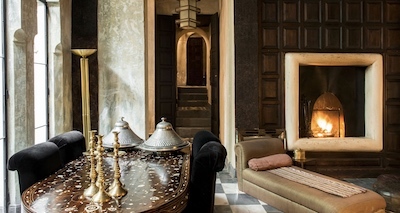 Garcia married his fondness for detail using velvet upholstery in jewel-like hues, dramatic color and romantic low lighting to compliment the Moroccan sun along with black and white tiled courtyard. The results are a flawless redesigned hotel that has kept the flavor, charm and architecture of the historical Mamounia with addition of a Moroccan modern flavor. 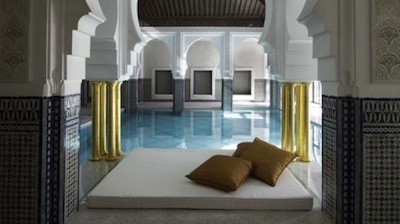 La Mamounia offers top end services from four elegant restaurants with top cuisine to stunning lounges, a luxury spa, heated pool and on site shopping options of high end goods. 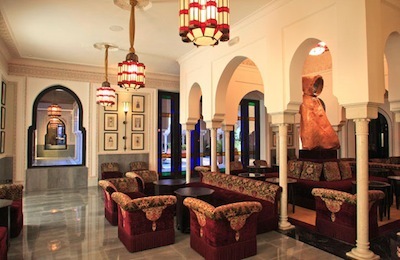 Three Riads set amongst the heart of La Mamounia’s wonderful gardens, each having 700 sq. meters of space to provide 3 bedrooms with excellent bathrooms, a large dining room and private pool on a terrace. Seven Signature suites each individually themed with original and unique Moroccan-style décor – The Churchill, The Majorelle, Koutoubia, Baldaquin, Marquetrie and The Al Mamoun. 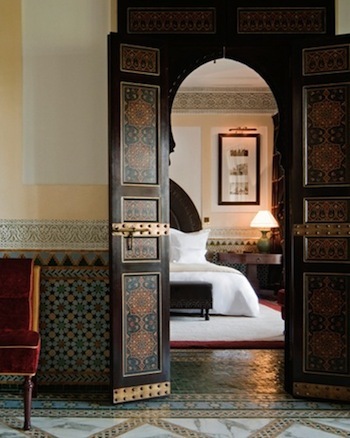 The Suites (64 in total) have views over the elaborate gardens, the Atlas Mountains or the Koutoubia mosque. There is a large lounge, and king size beds in the bedrooms. An executive suite offers a terrace and bathroom with separate shower and bath. The Moroccan suites have been decorated by local artisans. Four Prestige suites on the middle floors look over the gardens, their 100 sq. meters include 2 living rooms with dining and seating areas and a walk-in wardrobe. Comfortable and located between ground and first floor, looking over the city and gardens. 19 Superior rooms on the second to fourth floors display vibrant colors of Moroccan styling and look over the Hivernage. Deluxe rooms (104) are decorated with wood, leather, stucco and moucharabieh and have views of the Koutobia, park or the Atlas Mountains.